OHIO VALLEY — For those living along the Ohio River, tow boat traffic can often become routine. What can be exciting to visitors is commonplace for residents. Hundreds of tons of cargo are transported daily by riverboats, the sound of their engines mostly quiet background noise. Their presence may go unnoticed except for the lapping water as they push forward or the occasional horn blowing on a foggy morning. Often it takes something unique to gain attention, which is what occurred this week as the push-boat Mister Mac navigated the locks and dams, bridges, islands, and twists and turns of the Ohio River. The M/V (Marine Vehicle) Mister Mac is owned by McDonough Marine Service, a company specializing in transporting oversized cargo. 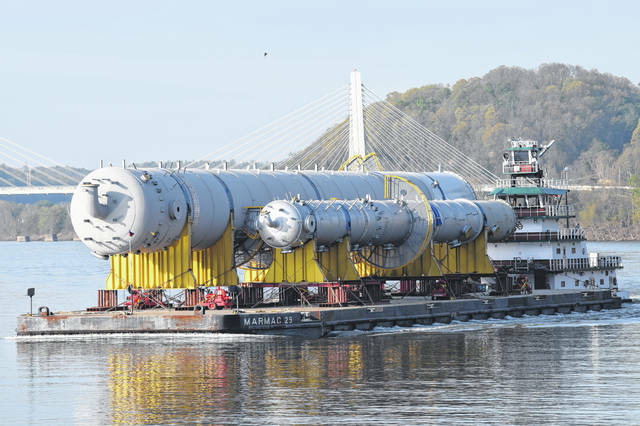 The boat was pushing a barge loaded with equipment for a natural gas processing facility in Pittsburgh, Pennsylvania, owned by the Shelly Corporation. The project cargo was too large to be moved by truck or rail, requiring the services of Mister Mac and crew. The Shelly Corporation selected their new site particularly for the proximity to river transportation. 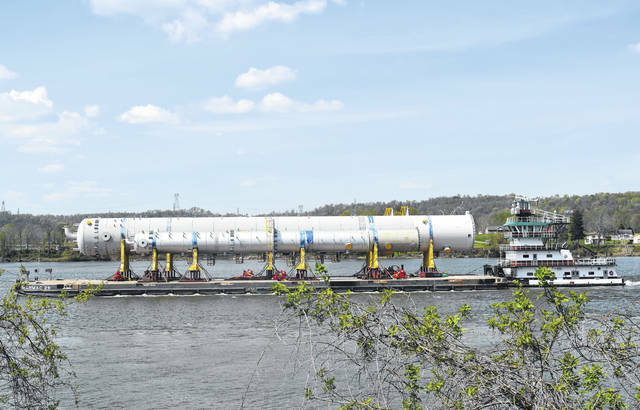 Not only did the site selection enable the delivery of the large equipment, it also provides them with cheaper transportation costs for additional building materials since river transport costs are much lower than rail or truck. A barge has a fuel efficiency of 576 ton miles. In comparison, a rail car has 413 and a truck 155, according to PJ Donovan and Lin Prescott from the Planning Center of Expertise for Inland Navigation and Risk Informed Economics Division (PIXCIN-RED) Great Lakes and Ohio River Division (LRD) located in Huntington, W.Va.
Donovan is Chief of the Center and Prescott is an economist . They said their work primarily focuses on economic evaluation and plan formulation, and that they are one of several national centers across the nation. “The value to the nation of our inland navigation system is realized in cheaper transportation costs which in turn means that the end-use consumer pays less when the transportation mode is less expensive,” Donovan said. Also included in the data are Carbon Dioxide Emissions per Million Ton-Mile. The barge with 19.3 tons as compared with the rail at 29.6 and semi trucks at 71.6 is more environmentally friendly. “A barge is the greenest when compared to other means of transporting the same cargos when it come to emissions,” Donovan said. A chart provided by Brian Maka from the U.S. Army Corps of Engineers Huntington, W.Va., office compares the cargo capacity of barges to railroad cars and semis; one barge is equal to over 13 railroad hopper jumper cars or 58 large semis. Expand that to a typical 15 barge tow on the Ohio River, and that equals two-100 car trains or 870 large semis. How much is transported on the Ohio River in a year? Statistics provided by PCXIN show that in 2017, the Racine Locks and Dam counted a total of 3,878 commercial lockages that included 23,924 loaded barges carrying 47,454,972 tons of coal, petro, grains, chemicals, ores and minerals, iron, and steel at a commodity value of $9,431,334,113. Residents along the river from Mason to Meigs County have been dealing with spring floods and are weary of the river. Perhaps by taking a look at the volume of products transported by river operations, residents may get a new perspective on the importance of river commerce to our community, as well as to the national and international economy and gain a new appreciation of the Ohio River.